In May 2014, the Federal Communications Commission (FCC) issued a report and order known as the Network Protection Standard. The guidance, backed by major cellular carriers, introduced new regulations for cell phone signal boosters, including specific technical requirements designed to minimize interference from consumer signal boosters to wireless networks and towers. Up to that point, cell phone signal boosters available in the market were relatively powerful three-watt radios, strong enough to knock out a network tower or create enough interference that would result in dropped calls. The interference led many networks and distributed antenna system (DAS) providers to call for outlawing signal boosters altogether. Fortunately, cell phone signal booster manufacturers worked with carriers and the FCC to design a compromise, which resulted in Network Protection Standard. The new standards reduced the legally permitted power of cell phone signal boosters from three watts to one. In subsequent years, tower interference from cell phone signal boosters disappeared. While networks welcomed the new standards, it meant many cell phone signal booster manufacturers needed to go back to the drawing board to create compliant, yet sufficiently powerful, cell phone signal boosters. The change in standards resulted in cell phone signal boosters that could be equated to the purchase of a car off the lot: they worked and met regulations. While these solutions were sufficient for some users, others needed more output. So, WilsonPro set out to design a cell phone signal booster with increased performance that still met all of the requirements of the new regulations. WilsonPro took the same basic engine of previous market models, and, with some fine tuning, found they could squeeze more power out of the new laws. Instead of buying off the lot, WilsonPro engineers built a race car by leveraging better materials that allow the “engine” to perform at maximum output. Their work resulted in the WilsonPro 1000, which provides a three decibel (dB) gain in performance versus other boosters on the market (+12dBm vs. +15dBm). The WilsonPro 1000 includes WilsonPro’s XDR (Extra Dynamic Range) technology which enables the booster to reduce power without shutting down under signal overload conditions. 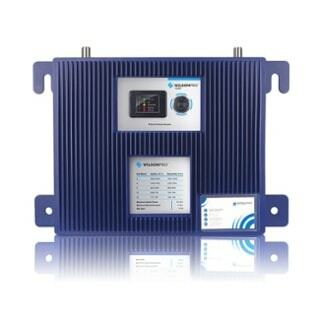 This unique XDR feature stands in contrast to many competing systems which shut down when they reach a maximum incoming signal strength threshold, causing the indoor cell signal to drop out. It also eliminates the need for costly site visits to restart a booster that has shut itself down due to oscillation or overload conditions. The WilsonPro 1000 provides enhanced cellular connectivity for a variety of commercial users across industries, including hotels, hospitals and office buildings. Contact us to learn more about how a WilsonPro 1000 can boost connectivity for your clients.